Watch Live—the Albatrosses Are Back! The Laysan Albatrosses of Kauai return to the big screen. Over two months ago, Laysan Albatrosses began returning from their epic ocean voyages to the green warmth of Kauai’s north shore to breed. Mated pairs met up again after long absences, greeting each other with beautiful dances and gentle nuzzling, ready to start anew at the task of successfully raising the next generation of winged spirits. 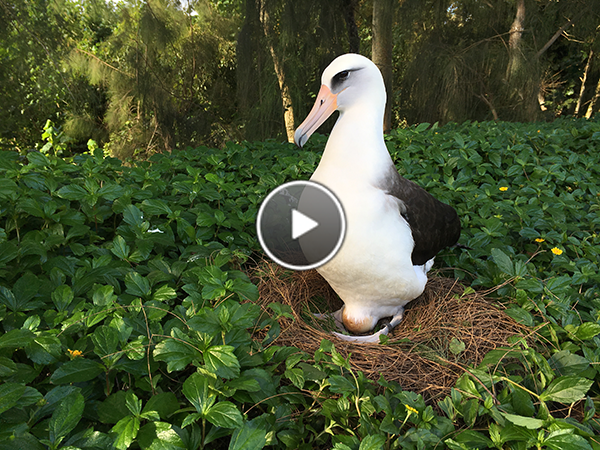 Thanks to the help of the Kauai Albatross Network and a gracious homeowner, you have a front row seat on our Albatross Cam!Watch cam. The parents of the central fertile nest, situated in front of the cam under the ironwood tree, are Manawanui (KP796) and unbanded Moana; the egg was laid on November 28, 2015. The parents on the upper nest to the right of Manawanui and Moana are male Mokihana (KP194) and female Ikaika (unbanded), and their egg was laid November 26. There is another fertile nest just out of sight of the camera, downslope; an egg laid on December 3 is tended by parents Ka`imi (KP093) and Lilinoe (KP688). It takes 62 days for a Laysan Albatross egg to hatch, so there’s around a week of incubation left at these nests. 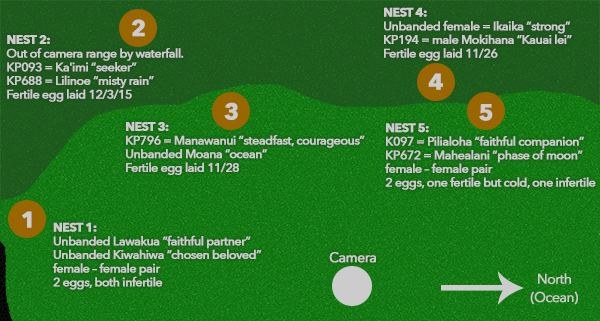 There are also two infertile nests being tended by two female-female pairs: Pilialoha (K097) and Mahealani (KP672) are at the lower nest (beneath Mokihana and Ikaika); and Lawakua and Kiwahiwa are at the nest to the left of Manuwanui and Moana’s nest, near the driveway. Female-female pairs are infrequent but have been well-documented on Kauai and Oahu in the past. Cooperative breeding behavior between unrelated adults is thought to be partially a result of there being more females in the population than males, and can lead to successful breeding attempts, making it a better option than not breeding at all. Though the eggs being incubated at these particular nests are infertile, the adults will continue to care for them until it’s clear they aren’t going to hatch, likely sometime in mid-February. Last year’s on-camera parents continue to nest at the property that formerly hosted the cam during 2014-2015. We will update about these pairs on Facebook and Twitter as we learn more about their nesting efforts from the Kauai Albatross Network. You can check out highlights from past seasons or learn more about albatrosses in our FAQs while we await hatch at the new nests. Special thanks to all of the volunteer cam operators and “tweeters” who will be doing their best to make sure that not a moment is missed—thanks for watching!